Are you looking for a great low carb breakfast casserole that carb lovers enjoy? 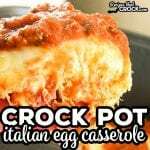 Our Crock Pot Italian Egg Casserole puts a tasty twist on your traditional breakfast egg casserole recipe. Coat a 6-7 quart slow cooker with butter or bacon grease. Mix eggs, salt/pepper, garlic, cream together. Stir in artichokes, peppers and prosciutto. Reserve enough cheese to cover top of casserole and chop remaining cheese and stir in. Pour into slow cooker and cook on high for 1-2 hours or until eggs are set. Top with cheese and drizzle marinara sauce over top of casserole and cover until cheese melts. This recipe was adapted from Eggs Italiana found in The Everyday Low Carb Slow Cooker Cookbook. We love using our non-stick multi-cookers for egg casseroles, but you can use any 6-7 quart slow cooker, just make sure to grease them well so the eggs don't stick. We use this low carb marinara sauce . If you are not eating low carb, feel free to just use your favorite sauce.